Here, in his own words, is the story of an extraordinary black American, son of a former slave, and father of Berry Gordy Jr., who founded Motown Records. Pop Gordy’s story starts on his father’s plantation in Georgia, in an old house with enough chinks in the shingles to let in the fresh air. Whether scrapping with his brothers and sisters, fooling his momma, walking the crops with his Papa, or scufflin’ hard to make his living, Berry knew how to enjoy everything he did. When he left the South to build a new life in Detroit, he took his love of family, fun, and honest hard work with him. Berry Gordy Sr., and his wife Bertha Fuller Gordy, arrived in Detroit from Georgia in 1922. Starting with odd jobs and later a small grocery store, Berry “Pop” Gordy established a succession of businesses, including a prosperous construction business. In the mid-1960’s, his son Berry, Jr., bought the business, fired his father, and immediately hired him to an executive position at the Motown Record Corporation. A churchgoing family, Mr. and Mrs. Gordy at first affiliated with The Church of God in Christ, and later became members of Bethel A.M.E. Church, for which Mr. Gordy served as trustee. Pop Gordy credited hard work in part for his longevity and, until his death, was working as a consultant to Motown Records. Completed before his death at the age of ninety in November 1978, Berry Gordy’s memoirs tell how he taught his family to make it in a white world—the lessons he learned from his father, his elders, and life itself. It’s warm, anecdotal style will draw readers of all ages to the story of this lovable man. “POP” Gordy was such a father figure to so very many of us who knew and loved him—not only his family, but literally thousands of others from different walks of life. Whenever any of us would feel the need to talk with this man, it was because we felt in him a kind of combination of strength, goodness, wisdom, and understanding such as is seldom possessed by any one human being. We knew that we had only to pick up a telephone and visit with Pop conversationally, if we did not wish to go and sit with him personally. Today a sense of his presence certainly is very much with every one of us who had the honor and the privilege to know him. 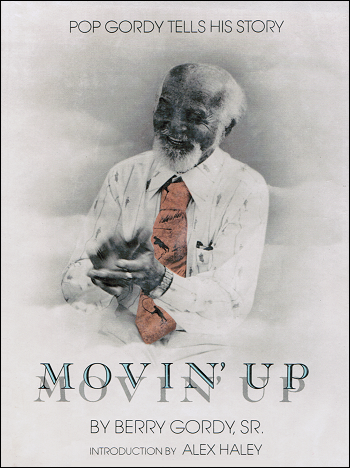 If Movin’ Up is to be your first meeting with Pop, then it is important that you understand it represents highlights of his long life as he recalled them in a number of tape-recorded sessions; and also that this Pop Gordy was a man who never attempted to be “fancy” in anything he ever said, or that he ever did, for that matter. For throughout his life, Pop was as simple, direct, and straightforward as he was honest, candid, and sincere. If you are to get the most out of Pop’s memories, which he shares with us here, you should realize that much of what Pop is telling us about are experiences of his boyhood, youth, and young manhood; he is, in fact, giving us a look at how peoples’ lives went scores of years ago in the part of Georgia where he was reared. You might want to compare Pop’s experiences with your own and consider whether and how much manners of expression and relationships between the races have changed since the time of Pop’s childhood. In Pop’s boyhood world, his father was one of the many men who farmed with their families’ help within the general area of small Sandersville, Georgia. But where most farmers ended each year once more in debt to the bank and various credit merchants, in the Gordys’ case it was different. Pop and his brothers and sisters grew up seeing the practically religious regard of their parents for keeping meticulous records of any business they were involved in, no matter how seemingly trivial or small. As one result, the Gordys were gradually able to save enough to buy more land, and a better home to live in. So the principles of hard work and careful business practices were early and indelibly impressed upon the Gordy children. Physically small for his age, Pop (or little Berry) also learned how to use his quick fists to gain respect. To be sure, he loved his pranks and mischief, which brought him frequent switchings and whippings from one or the other of his parents. You must chuckle when Pop recollects his bumbling, futile efforts to lie to his daddy about how a dog had attacked a cat that had killed an “invisible” rabbit. Or you can’t help be tickled as he steals his fill of his mother’s preserves, which she had thought he thoroughly disliked; and at his efforts to prevent his first girl friend’s discovery that he and his brother and sister had to walk for miles to get home from high school. You will pull for Pop’s battling school-yard bullies, until he finally beat their biggest and toughest, thus earning their respect and even their friendship. Pop’s father somehow sensed in him the special potential of a businessman, and let Berry accompany him into town to do the necessary “figgerin’ ” when business was conducted with various merchants. Berry developed the habit that when not working, he spent much of his free time alone, simply thinking about things he had read, seen, or heard—especially things he had overheard from local elderly people, particularly his beloved grandma. Later he would tell his own children that he found that listening quietly to elderly people’s conversations had taught him as much as anything he had ever learned in school. No part of this book is more emotionally moving than Pop’s account of the tragic, abrupt death of his father, which left their whole family feeling ravaged. But it would seem as if his father had been training Berry to become the “administrator” who would attend to family affairs. It was soon locally circulated that the young Berry was nobody’s fool. Meeting a pretty local schoolteacher named Bertha Fuller, young Berry Gordy convinced her that she should marry him. He expanded his business activities. He sold beef from a cart. He raised and sold pigs. Then when he sold for his family a large number of timber stumps from their joint property, he feared to cash the resulting $2600 check anywhere locally, lest it cause problems, and upon advice he took a long train ride to cash the large check in Detroit. After Pop was married, he moved his family to Detroit. You will read how Pop taught himself to plaster and to do carpentry, until he became a contractor. He bought a grocery store, which became a small institution within the east side Detroit black community. Pop and his good wife, Bertha, continued their job of raising a family of eight children with such quality that they would live to see their family acclaimed as one of the most outstanding black families within the nation. Among their children, the next to youngest son, Berry Gordy, Jr., who is the chairman of the board of Motown Industries, one of the major forces within the world of American popular music, said recently, “I express the opinions of my brothers and sisters on very few subjects—except Pop. Pop had his executive-suite office on Motown’s eighteenth floor, and it soon became known that if anyone at all had some problems to discuss, there was a willing ear in Pop Gordy. The people who turned to him ranged from unknown young recording artists to some of the topmost stars in the business. In a rare testimonial, four of the greatest stars in the nation—Diana Ross, Stevie Wonder, Marvin Gaye, and Smokey Robinson—joined in making a recording titled “Pops, We Love You!” which became a rapid-selling single, although it was done as a birthday tribute for Pop in which the four stars expressed the sentiments of the many hundreds whose lives Pop had touched. Then one midnight, Pop’s daughter Anna telephoned her brother Berry, Jr., saying that she was visiting Pop, who had indigestion. Berry went over, and the three of them talked into the wee hours, until Pop Gordy fell asleep. The next morning he arose ready for breakfast, but in an hour he was dead. The Gordy family was only acting out what had been one of the favorite sayings of Pop, that he had told to so many of his friends and admirers. “You can give without loving,” Pop would say, “but you cannot love without giving.” ~ Alex Haley, 1979.